Microwaveable - ready in 5 min! No artificial colours, flavours or preservatives. Deep frozen. Vegetarian. Moist chocolate sponge covered with a rich chocolate sauce delicious hot or cold. 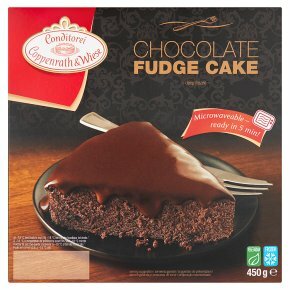 Remove product from all packaging.Microwave 650 W (Defrosting not required):Place the cake on a suitable plate with a microwave cover.Chocolate melts while heating.Allow cake to cool for 1 min.Chef's Tip: Enjoy warm!Defrost at room temperature 1.5 hours.